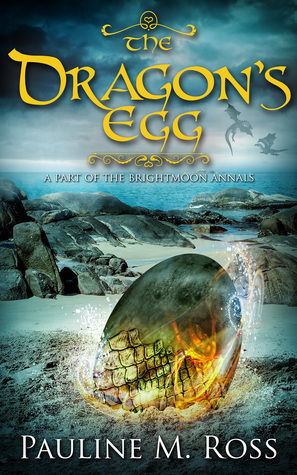 The Dragon’s Egg is the sixth book in the Brightmoon Annals by Pauline M Ross. Like its predecessors it stands alone, introducing a new cast of characters and bringing in a few from previous books to help the protagonists along. As with the previous books, this latest fantasy adventure explores the strange magics of the Brightmoon world, and how the civilisation from before a mysterious ancient Catastrophe sought to preserve magic as they faced down their own extinction. Disclaimer: I recieved an ARC (Advanced Reader/Review Copy) of this book in exchange for an honest review. The Dragon’s Egg centres arounds Dru, an odd girl who hatched from a dragon’s egg, as the people around her seek answers about her origins and her abilities. The story follows a gambler, a princess, a scholar and others as they accompany Dru around the world in search of answers, coming into contact with an array of cultures and societies – and a few characters fans of Ross’s works will already be familiar with. At first I found it odd that the story is told not from Dru’s perspective, but from the points of view of her companions at various points in her journey. But given her character it makes perfect sense; she is strange, asking no questions, volunteering no opinions, taking everything quite literally. She would have made an uninteresting perspective character, and so presenting the story from the views of those around her, and seeing through their eyes the reactions she inspires, makes a far stronger narrative choice, even as those characters’ storylines orbit her to varying degrees. The questions surrounding Dru – where she comes from, why she is the way she is – maintain a thread of mystery that powers the plot. Even as various obstacles confront the group and send their path in unexpected directions, those questions remain at the core, pushing the characters to seek out solutions not only to their immediate problems, but also which help them towards their overall goal. Once more Ross delves into a rich world, exploring in fresh depth the history and geography of her incredible universe. A wider view is given of the world, with multiple cities and societies visited and their unique obstacles navigated. Here, more perhaps than in previous books, the dynamic nature of her world is made clear. Changes in one society, for example, have an impact on an outpost last seen in The Magic Mines of Asharim, presenting an obstacle in the path of Dru, Garrett and their companions. Ross has, once more, triumphed in this sparkling tale of adventure and magic. NIce review! It was an unusual book, but very enjoyable (except the ending made me cry!). It was a brilliant but indeed sad ending. Foreshadowed well too.